Oh if you could only hear the things that we hear from wedding vendors, both during and after, a wedding. It’s not meant to harm though. It’s much like any other job held by anyone anywhere. Doctors complain about patients not following their release instructions when they get out of the hospital. Mechanics complain about people not following the routine maintenance schedule for their vehicles. Teachers complain about students not following directions. Regardless of their chosen profession, people are gonna “talk shop” with their peers. Sometimes it’s just complaining, but more often than not there’s some truth behind those snarky comments. So Shea and I asked wedding photographers, both locally and nationally, what they would like to tell their brides – FOR REAL, if they could be as honest as they wanted. And we promised not to reveal names (or locations). As I’m sure you can imagine, we got some very, ummm…..hilarious responses! If you’re easily offended you might want to just skip on out for the rest of this one. And just so you know, we DID NOT censor any of the responses. Please remember – these comments are not our own, but they are real! 1.) It cost me money to shoot your wedding—just because I own my camera doesn’t mean I don’t have expenses. I spent $850 last year on just cleaning, maintaining and servicing my camera and lenses. 2.) I need to eat when you do. I can’t photograph people eating (gross). But if your servers say they won’t feed us until AFTER the guests then I don’t get to eat because that’s when “the couple” is finished and the action starts up again. And I’m starving all night. Please give instructions to the caterer to feed the photographers at the same time as the wedding party, NOT after the last guest. 3.) Let me know your budget right away – for real! I get a ton of emails and THEN when we meet they say “Oh, we wanted to spend less than $3K” and then everyone’s time is wasted and everyone is frustrated and all disappointed. 4.) Make sure to tell your guests you’ve hired a professional. I have TONS of photos of guests standing in the aisle with their iPads and cell phones, completely blocking the shots of the bride and groom! And sometimes I even miss pictures that I really need to get because someone’s “amateur photographer” cousin decides to use your wedding to build their portfolio. Can we say too many photographers?! 5.) I don’t just work for 8 hours on your wedding day. For each hour I shoot I probably spend 1-2 hours just editing your photos. Not to mention the time to spent on your engagement sessions, bridals, emails, etc. So your 8 hour wedding is more like 30-50 hours of work, depending on how many sessions you have. 6.) Those great bridal portraits you saw on my website were taken at places that charge $$$. Great locations are rarely free. If you want free, you get the Capitol. If you want Laguna Gloria, it’s $100 for a session. If you want Hotel Saint Cecilia, it’s a lot more. And don’t ask me if we can sneak in anyway. Yes, they will know. And no, I won’t ever be allowed to shoot there again. You’re not the only client I will ever have and I have to be respectful of the properties in this town if I want to be able to shoot there in the future. 7.) I work during the week so my weekends are for weddings. It’s really hard for me to meet you on Saturday afternoons. Again, because I’m actually shooting a wedding at that time. Somehow people think I should make my schedule totally fit their needs. And I’m okay with that to a point, but an 8 p.m. consultation on a Wednesday night doesn’t work for me. You’re single with no kids or responsibilities yet. I have kids and a family now. You’ll understand in a few years. 8.) Please, for the love of God, do not copy some online “list” that tells you what pictures you should have your photographer take. Really think about the family combos you actually want–and be realistic. 9.) Speaking of photo lists, you hired me based on liking my work. Trust that I will tell your story as I see it. I can’t make moments like “mother of the groom and groom in a teary eyed embrace” when they are not a huggy family. 10.) 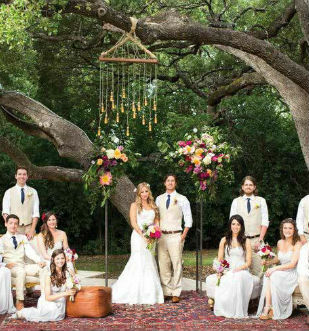 Think about your ceremony time and ceremony location. If you want a sunset wedding, your post ceremony images are going to be in the dark. Also, if you have a noon wedding, lighting is harsh and you’re not going to look very good. 11.) The Knot blogs are so full of crap. You are hiring me for MY style and skill, not because I am a robot checking off a list. While they attempt to offer you some helpful tips, they really end up making us sound like we’re all the same – and we’re clearly not! 12.) Please let us in on the special details of your day. If you’re wearing your grandmother’s locket as your something old, let me know! Those are important details that I want to capture for you. 15.) Can we say Uplighting? A little (blueish, purple) uplighting instantly makes your wedding photos look so much better! 16.) You should use Pinterest as inspiration only, NOT to be a copycat. Drives me CRAZY to have the “let’s hold up a picture frame and take a photo”. Ugh! Let’s do something a little more original already. 17.) Please hire your own wedding coordinator. The venue chick takes care of her staff and makes for sure that you don’t mess up anything at the venue – not the way the wedding day moves along. Otherwise, I end up moving it along. And that puts a lot of additional stress on me. 18.) Can I just say, No dollar dance? Never, ever. It’s so done. And so tacky. And awkward. That is all. 19.) Think about your crowd before you do a garter or bouquet toss. If all of your friends are married and you have 2 single friends, you should skip it. Oh, and the ever awkward act of making the guy who caught the garter put it onto the chick who catches the bouquet. Just tell the DJ NO!!!! I’ve actually seen a bridesmaid leave the room crying after this once – so terrible. Some people are just shy. 21.) Go get fitted for a GOOD BRA! If you are over a B cup you cannot wear a strapless dress without a bustier. And cutlets aren’t bras ladies! So sick of the tugging up of the dress all night. Or better yet, the Nip Slips! Yikes! 22.) While we’re talking about bras – please, for the love of all things holy, pay to put straps on your dang dress. If you can’t do jumping jacks without the ladies falling out, you need a better bra – or straps. 23.) Don’t be a bridezilla on your wedding day. No amount of photoshopping can fix “bridezilla”. 24.) Don’t worry about getting your dress dirty, so that you opt to skip photos until after the ceremony or let your sister tell you that the spot I’ve chosen (based on beautiful lighting/background) will ruin your dress. It’s important to keep it clean to a point, but know that this is the ONLY day you’re going to wear it. So WEAR IT and be confident (because freaking out about letting the bottom of it drag – which no one will ever see – and losing pictures, is way worse)! 25.) Brides should go first (or close to it) for hair and make-up. Too many times bridesmaids make lots and lots of changes and that takes up the make-up artists’ time, which makes the bride late to start – which means late first look, rushed bridal party portraits, and all together… less photos. Bridesmaids can really sabotage a day. And sometimes on purpose! 26.) Try to keep the room neat. No, I am not photoshoping out G-strings from your photos. Clean up the room you are getting ready in so it looks nice during those shots. 27.) Photographers love first looks! These are almost always our favorite pictures of the entire day. 28.) Trust your photographer! Most of the best shots are the ones that require something outside your comfort zone. If your photographers suggests a location, she’s probably got a pretty amazing idea in her head. Just go with it! 29.) Tip your photographer AND his/her second shooter, even if they’re the owner of the business. Just about everyone else gets tipped at a wedding. Even the guy that’s bussing your table. And I went to school and have years of specialized training for what I do! Trust me, we do appreciate it! 30.) Instruct your DJ to communicate with the photographer during the reception. It’s best if they let me know BEFORE they start the cake cutting, bouquet toss, etc., so I can be prepared for these shots. Your aunt Margorie might have dragged me into another room and is having me take pictures of your second cousins twice removed while something important is happening on the dance floor. And then I’ll miss it. And you’ll be upset. And so will I! 31.) Don’t crop out our watermarks and tag our facebook pages. In some cases, what you’re doing is actually illegal and a violation of your contract with us. And it’s just not nice. If I have my watermark on an image, it’s supposed to be there if it’s a publicly posted image. 32.) Couples should think about their kiss when they say ‘i do’. It’s hard to edit an all tongue kiss. Eww! Make it a good “church kiss” and don’t forget to hold it for a few seconds at least. I have had couples that kiss so fast that I get a shot right before and right after, because the kiss is actually faster than my cameras burst rate! 33.) Just say no – to body glitter! It looks awful in your photos – and you’re not a member of the Twilight cast. Well I asked for it – and boy did I get it! Yes, it’s a pretty exhausting list. But they all took the time to email me so I thought it was only right to post them all. Are some of these funny? Yes! Are some of these ridiculous? Yes! Are most of them totally accurate? You better believe it. And there you have it – the 33 things that your wedding photographer really wants to tell you – but can’t without hurting your feelings. Look out caterers! I’m coming for your answers next! Haha! This is such a great gritty and honest post. I love it all. Thanks for the wealth of information. All of the area photographers give you a collective high five. This list is spot on! Thank you for sharing the our side of our story. We work hard to try and give you the best memories of the day. It’s not all roses, but fun just the same. Excellent tips, #4 is always something I point out… feed me! lol Love these. love this!!! so very true. Agreed! Awesome post, you definitely compiled a great list here! Haha, I had a good chuckle out of a bunch of these. So much truth! Haha LOVED this! I like 21 and 22!!! Yes! : ) AGREE! Love this and think all couples should read!! !